The Syrian army gradually invaded Lebanon starting early seventies by forming and training Syrian-Palestinian guerrillas called Sai'qa. They started a civil war in Lebanon that led to a larger Syrian involvement in Lebanon. On October 13, 1990 the Syrian army completely occupied Lebanon capturing the Capital Beirut and the Presidential palace after air raids. The Syrian forces have been committing all types of terrorism against the Lebanese people assassinating their leaders and massacring civilians for the past three decades. Syrians have formed, trained and sponsored terrorist groups that carried terrorist attacks against the Lebanese people, other Arab countries and Western interests in Lebanon and abroad. Here is a part of what the Syrian Baath regime have been committing in occupied Lebanon..
Rafik Hariri was assassinated in Beirut on February 14 th , 2005 by a car bomb that killed ten other people.Multi-billionaire Rafik Hariri was appointed as Prime Minister of occupied Lebanon for several terms between 1992-2004. His economic plans for reconstruction and economy reform were conflicting with the pro-Syrian president “Emile Lahoud” position . Hariri resigned after a conflict with the Syrian regime that insisted on renewing the term of Lahoud. Hariri joined the opposition parties that demand Syria to withdraw its troops from Lebanon, and quit interfering in its politics. The Syrian regime was frustrated when the most prominent Sunni-Muslim leader in Lebanon joined the opposition coalition. The opposition was scheduled to meet Hariri at his house on February 14, 2005. His death did not prevent the meeting, they met at Hariri's apartment and publicly accused the pro-Syrian government and Damascus of being behind the assassination. Marwan Hamade, was a Lebanese minister who resigned from his position protesting the Syrian interference to renew the term of the Pro-Syrian president in Lebanon Emile Lahoud. Hmade was the major aid of Walid Joumblat, the prominent Druze leader, who joined the opposition parties that demand Syria to withdraw its troops from Lebanon, and quit interfering in Lebanese affairs. Hmade Escaped an assassination attempt by a car bomb in October, 2004. 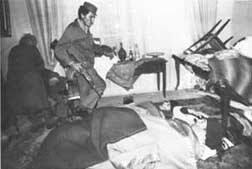 Ramzi Irani's decomposing body was found in the boot of his own car in a run-down area of hotels and bars in the west of the Beirut on May 20, 2002. 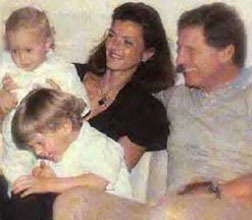 Irani was kidnapped in broad daylight in the canter of Beirut 16:30 local time Tuesday the 7th of May 2002. Irani was a 36-year-old engineer but he was also the Lebanese University representative of the Student Committee of the L F.
The Lebanese Leader Dany Chamoun was brutally killed with his wife and two children (5 and 7) after the Syrian completely occupied the capital Beirut. On October 13th, 1990, The Syrian forces launched an aerial and land attacks on the Lebanese presidential palace and the Lebanese army headquarters. The Lebanese army and the people supporting their government could not resist the vicious attack. The Syrian troops took over the area committing massacres against the surrendering Lebanese troops and civilians. Hundreds of people were killed. 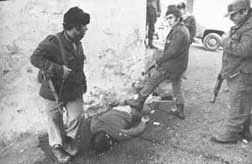 More than a hundred Lebanese officers were shut dead with a bullet in their heads, after they surrendered themselves. Hundreds of Lebanese soldiers, civilians and even priests were kidnapped and transferred to Syrian prisons. The Syrian regular troops and their proxy guerillas looted the residential and governmental possessions. The Syrian Intelligence services put their hands on the Lebanese Ministry of Defense and transferred its archive, equipment, computers, maps and strategic historic information. The Syrian occupation forces appointed a Lebanese collaborator as a president who formed a pro-Syrian government in Lebanon, while the legitimate prime minister of Lebanon was sent to exile in France. In its attempts to oppose the Lebanese government, Syria tried to impose a proxy-government in the Lebanese regions under its occupation. Syria appointed Rene Mouawad as a President of the areas it occupies in Lebanon. 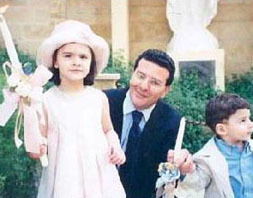 When Mouawad tried to conceal with the Lebanese constitutional government a big dispute grew between him and the Syrian officers. He was assassinated by blowing his car in the area occupied by the Syrian troops in western Beirut on November 22, 1989. The Syrians later appointed a Lebanese president, who would not dare refuse their orders, and placed him in the Lebanese presidential palace after occupying it in October 1990. Mufti Hassan Khaled, the highest Sunniy-Muslem clerk in Lebanon, was assassinated by the Syrian intelligence services after he confronted the Syrian with the UNESCO massacre. The Mufti indicated that the Syrians are shelling both the Christian and Muslim sides of Beirut to instigate a religious conflict. 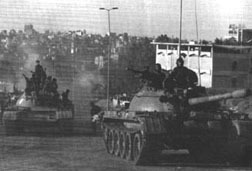 The Syrian army used its heaviest Soviet-made artillery, Especially these equipped with 240 and 160 millimetres canons, to pound both the East and the West sides of Beirut, on March 14, 1989, in a response to the exceptional support of the Lebanese people for their constitutional government. Tens of Lebanese were killed in the onslaught especially in the UNESCO area. 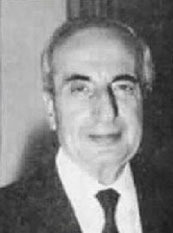 Dr. Mohammad Choucair, an advisor to Lebanese President Amine Gemayel was killed inside his home in the Syrian controlled part of West Beirut on August 2, 1987. On November 22, 1986, the Syrian army kidnapped hundreds of civilians from the city of Tripoli (largest in Northern Lebanon) in retaliation for attacks against Syrian military and intelligence positions. The bodies of many who were kidnapped were found in the streets of Tripoli and its suburbs. A week later, the Syrian Special forces liquidated 34 residents of Tripoli on charges of "opposition to the Syrians." 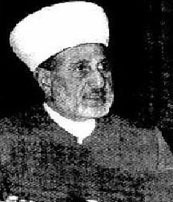 Syrian agents murdered the head of the Islamic Shiite Higher Council, Sheikh Soubhi Saleh, who was shot in broad daylight on October 7, 1986. President elect Bashir Gmayel (1947-1982) was killed along with many of his companions in the explosion of his party's Beirut headquarters on September 14, 1982 by the SSNP (Syrian Socialist National Party). The assassination took place nine-days before he was to take office as the Lebanese President, and before the international plan of the withdrawal of all the foreign forces from Lebanese soil was fulfilled. The assassination halted the Syrian pullout. In the following year, Syrian-sponsored groups launched suicide bombing attacks against the peace-keeping US and French forces barracks killing 300 of them. The multinational forces were forced to leave Lebanon while the Syrian troops advanced into Beirut. Syrian artillery suddenly and furiously bombarded East Beirut at a time when students were leaving schools to head home on April 2, 1981. Casualties and injuries were in the Hundreds. The Syrian intelligence services killed Riad Taha, the head of the union of editors on July 22, 1980 in their persecution campaign against free journalism. Working on silencing the criticism of the Syrian invasion of Lebanon, Syria persecuted and assassinated several Lebanese journalists. Journalist Selim Lowzi was kidnapped for nine days, but found dead in the forests of Aramoun, near a checkpoint for the Syrian Special Forces on February 24, 1980. Lowzi was known for his articles opposing the Syrian regime. On February 2, 1980, the Syrian special forces attacked the village of Knat. The villagers resisted for six days, but the Syrian forces were able to take over the village, using heavy bombardment with tanks and canons killing tens and destroying the village. 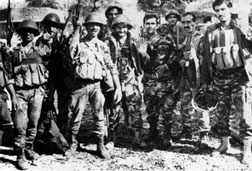 On September 30, 1978, fierce battles took place between the Syrian army and the residents of East Beirut when the Syrian forces tried to advance into the area. The Syrian forces retaliated with heavy artillery leaving hundreds of innocent civilians dead and many more injured. 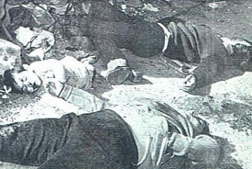 On June 28, 1978 armed gunmen affiliated with the Syrian intelligence services attacked the villages of Ka'a, Ras Baalbeck and Jdeidet El Fekeha, kidnapping a tens of their residents. Many of them were found dead while a good number of them remain missing. On November 5, 1977 the Saheka forces attacked the village of Aishiyeh killing 41 of its residents and displacing most of the others. 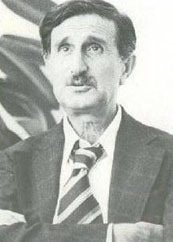 Lebanese leader Kamal Jounblat was assassinated near a Syrian checkpoint on March 16, 1977, after publicly criticizing the Syrian invasion of Lebanon. After the Syrians attempts to spark a sectarian conflict between Christians and Druze in Chouf region failed, rather that unified the Lebanese against the Syrian military interference in Lebanon, Syria assassinated the Druze leader Jounblat and followed that by killing 250 Christian civilians in the city. 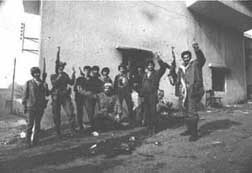 The Syrian-formed Saheka Guerrillas and the Syrian-led Yarmouk Palestinian Guerrillas attacked the Christian town of Damour on January 21, 1976. 582 civilians were massacred, while the rest of the residents were uprooted from their town. 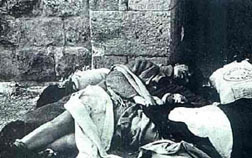 Both Christian and Druze leaders tried in vain to stop the attack, but the Syrians went in their plans hoping to create a sectarian strife among the Lebanese in order to distract the attention to their invasion of the country. 1- Yarmouk & Sai'qa guerrillas round up a Lebanese family outside their burning home. 2- The same family is taken away by the guerrillas to meet their fate. Elderly residents of Damour a moment before being killed by a Libyan mercenary. On October 9, 1975 Saheka forces attacked the Lebanese village of Tal Abbas in Akkar killing 15 people and injuring many others. The local church was set on fire with the hope of igniting religious strife between the residents. On September 10, 1975, Syrian-formed Saheka forces attacked the village of Der Ashash, in Northern Lebanon, killing three priests and causing its residents to flee. The following day, Saheka forces and guerrillas from the Syrian Baath Party attacked the village of Bet Mallat killing seven of its residents and kidnapping 10 others. Thousands of Lebanese prisoners have died in Syrian prisons under torture. Till now there are hundreds detained in Syria without any accusation or trial; some of them have been there for 27 years. From Israel to Damascus, Robert Hatem, 1999.